Like most people, I like to think I know what I’m doing. I’ve learned to trust my own instincts in most areas of life, and hunting is a situation in which going with my gut has served me pretty well. I’m not one to throw around terms like “expert” or “guru,” but I consider myself to be relatively knowledgeable on the topic of hunting. After all, you’ve got to have a fair amount of confidence and know-how to guide hunts. That being said, I’ve learned a thing or two about my own limitations, and what it means to truly admit that I don’t know it all, and maybe someone else does (hint: it’s God.) A particular turkey hunting excursion from this past May comes to mind. 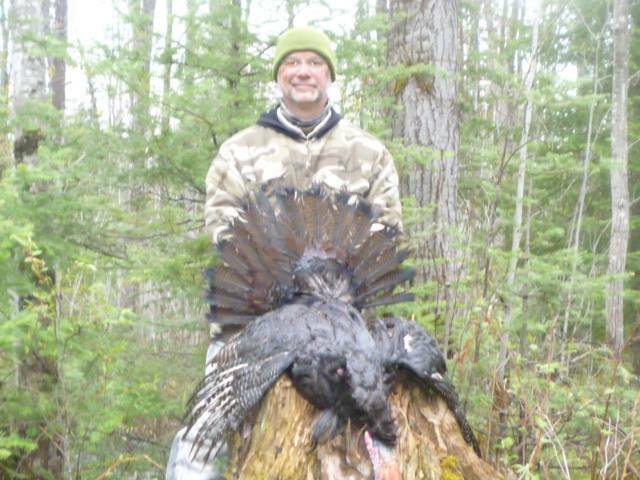 I was guiding a hunt in Atlanta, Michigan for Keith, a 10th grade English teacher from our local school district. I’ve guided quite a few hunts in Atlanta over the past few years, and I’ve spent a good chunk of time navigating its seemingly untouched forests and well-worn two-tracks. Even with all that wilderness, one of the best hunting spots I’ve grown fond of is Jim Hartford’s front yard. Jim is a local hunting enthusiast with whom I’ve developed a rapport and a sort-of working relationship during my time as an outfitter. He’s been gracious enough to allow me to guide hunts on his picturesque piece of property, which is teeming with white tails, elk, turkey and bear. Prior to this particular hunt, I’d spent two days pre-scouting Jim’s property, and I’d noticed plenty of signs of turkey activity, especially on a ridge that ran parallel with his driveway. I’d observed multiple gobblers among the turkey flocks in the vicinity, and I was feeling pretty confident about Keith’s chances at bagging a bird. I made the decision to nix any calling exercises during my time scouting, as I figured it’d prevent the call-shy turkeys from being spooked away. On the first day of Keith’s hunt, I brushed off Jim’s advice and had Keith set up on the ridge. A couple toms feverishly responded to my calling but stubbornly remained out of shotgun range. Later that day, closing in on the last few legal shooting hours, we were met with the same resistance from the tom turkeys. Having had a nice day out but scant success, Keith and I retreated up the driveway to his pickup. We were greeted by Jim’s wife, who described two beautiful toms who had been strutting and gobbling no more than thirty yards from the Ram pickup. I’ll admit I felt a bit sheepish that we hadn’t had the same luck in my chosen spot. Keith and I headed back to the cabin for dinner and to develop the next day’s game plan. As we were sitting down at the dinner table, Keith put down his fork, looked at me squarely and said, “Why are you bucking Jim’s advice of sitting out on the driveway? I mean, he’s the property owner. He probably knows what he’s talking about, right?” He punctuated his audacity with a crooked grin. Keith’s words stuck with me. The next morning, after grabbing coffee and breakfast, we drove to Jim’s turkey headquarters. I grabbed the blind, our chairs and the decoy from our spot on the ridge and walked towards the curve of the driveway. Keith followed my lead, a crooked, knowing smile on his face. He looked confident that he’d chamber his 12-gauge 3-inch Magnum once our setup was complete. We sat quietly as the sun came up and basked in the sounds of robins chirping. Moments later, as the sun began to rise, a gobbler broke our anticipation-laden silence, keying us in his location – just where Jim said he’d be roosted. It was our turn. I pulled out the Rod Benson “Cherry Poppin’” slate call and gave my best. The gobbler responded. The hens then pushed me aside and schooled me on what yelps and clucks really sound like. Minutes later, it was obvious that the small flock was heading our way – yes, right down Jim’s driveway. Keith, being a right-handed shooter, sat to my left. The blind was tight but not cramped, but it felt smaller as the turkeys got closer. Our hopes were that they’d come to a few soft calls and catch a glimpse of our decoy on the mowed piece of grass past our blind. Keith and I whispered about how important it was to keep the turkey’s focus off the caller and on the decoy. With all the excitement of the moment, we forgot about Jim’s orange traffic cones on the curve of the driveway – a safety precaution for his local UPS driver. 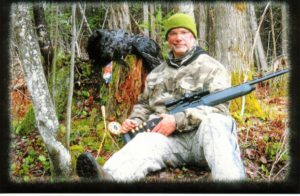 I knew those construction distractions would obscure a guide’s interpretation of a turkey hunt, but Keith knew that they were just part of the story – his story. Within five minutes, the hens came by with the gobbler in tow, completely fanned out in all his glory. After emitting a few gobbles and focusing in on the decoy, the hens passed Keith’s shooting lane. All that was needed now was Mr. Tom. The gobbler followed in the hens’ footsteps and then hesitated. Keith’s superbly-placed shot dropped and finished the trophy gobbler right where he last showed his patriotic colors. Exiting the blind took longer than the sprint to the downed bird, proving a clean kill from Keith. His crooked smile said it all: relax, Gary. Sometimes it’s best to put your trust in someone else. And that’s just what I did that day – I realized that there are times when I’m right, and times when others are right. And out of all of that, there’s the One who’s always – always – right. Sometimes, amidst the paradoxical chaos and solitude of wilderness and wildlife, flora and fauna, the best feeling is realizing that you don’t have to be right, because God’s already got that covered. Amen!